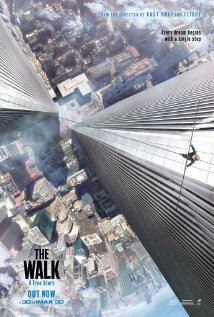 Movie Review: “The Walk” wasn’t so vertiginous as I wanted it to be. Director Robert Zemeckis whose name is immediately associated with other successful blockbusters such as “Back to the Future”, “Forrest Gump”, “Cast Away”, and “Flight”, didn’t impress me much with this real story focused on the remarkable achievement by the obsessive, temperamental, and courageous Philippe Petit, here played earnestly by Joseph Gordon-Levitt. Petit got famous for walking over the Manhattan’s skies when he crossed the 42 meters that separated the extinct World Trade center towers on a wire. The French artist narrates his own story from the top of the Statute of Liberty, taking us to 1973, the very beginning of his Parisian career as a small crowd entertainer – juggling while high-wire walking. There, he meets a sweet street musician, Annie (Charlotte Le Bon), who at first felt annoyed with his presence since he was stealing all the audience. After conquering Annie’s heart, he fails his first public presentation, but redeems himself accomplishing the following mission of walking on the Notre Dame cathedral and consequently gaining a few devoted accomplices who offer themselves to help him fulfilling his big dream. His riskiest task ever is going to take place in New York and requires a careful and meticulous preparation that is given by Papa Rudy (Ben Kingsley), a circus owner and old expert in the high-wire art, who teaches him a few precious secrets. Sometimes accused of being selfish and arrogant, Petit was able to join an efficient, friendly team that includes the ‘anarchist’ photographer Jean-Louis (Clément Sibomy) who will cover the grandiose expedition. Perhaps because I still have so clearly in my head the magnificent documentary “Man on Wire”, superbly directed by James Marsh in 2008, which addresses Petit and his deed with precision and vitality, “The Walk” feels a bit too much pretentious in its somewhat irritating approach. The dazzling visuals aren’t devoid of disquietude, but the film only provides regular entertainment without agitating us in any occasion with surprises or giving another concept to a form that was nothing more than banally standardized. Mr. Zemeckis, whose filmography comprehends fantasy, animation, and real drama, never made me feel the creeps or soar over the slightly misty blue skies of Manhattan.